The closest player, on the left is our section leader, Rhys Owens, playing on his newly acquired Yamaha New York trumpet at the time. Sat beside Rhys is the great lead trumpet, Mike Lovatt, playing second trumpet on this occasion. This will probably surprise many, because Mike is famed for his strong lead trumpet playing in the jazz field. He was playing lead trumpet for us in our Beatles themed programmes in Shang Hi and Bejing. Mike is actually classically trained and slots into the genre quite comfortably. That’s me, holding the Bach Cornet. in my capacity as Principal Cornet player. That cornet is the instrument I have owned the longest. It used to belong to John Wilbraham, so it is getting on a bit! 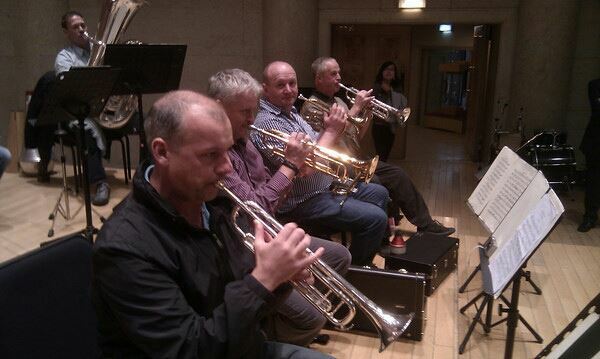 On the far end is Paul Marsden, our RLPO second trumpet, also playing on his newly acquired Yamaha trumpet at the time. Paul is just warming his chops up, prior to picking up his Boosey & Hawkes cornet. We are about to begin rehearsing that fabulous overture ‘Cockaigne – In Old London Town’ by Elgar in the Forbidden City Concert Hall in Bejing. The guy on tuba, in the background is Brian Kingsley, normally to be found across the Pennines playing for the Orchestra of Opera North. Our own tuba player, Robin Haggart was unable to go on this three week tour as the birth of his first child was imminent. We played several concerts with both Vasily Petrenko and John Wilson taking it in turns to conduct in Shang Hi and Beijing, including representing Liverpool at the World Expo in Shang Hi on the trip. The second photo which turned up today is this more recent one, taken last month at Hope Cornerstone. Ensemble 10.10 were performing a concert in Hope Cornerstone playing a programme consisting of a piece written by Graham Fitkin for the new train built to get the hordes of spectators to the London Olympics last year. 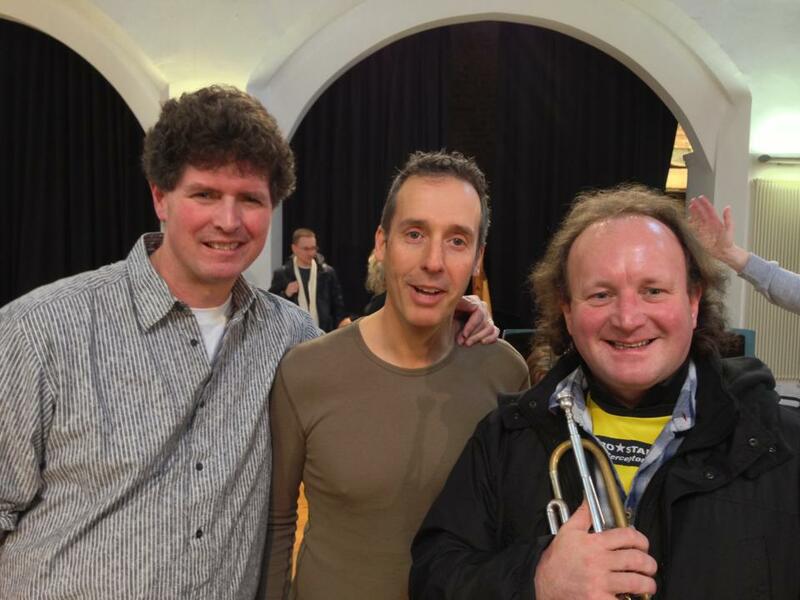 The piece is called The Athlion, afer the train, and this photo shows Clark Rundell, Graham Fitkin and me having a laugh at the end of the rehearsal! I have more hair now than I had in the first picture! This entry was posted in About Brendan Ball, The Tour Blogs & Brendan's Solo Blogs and tagged "Royal Liverpool Philharmonic Orchestra", 'RLPO', Beijing, Brendan Ball Trumpet, Cockaigne, Elgar, Forbidden City Concert Hall, John Wilson, Mike Lovatt, Paul Marsden Trumpet, Rhys Owens Trumpet, Shang Hi, The Beatles, Vasily Petrenko, World Expo 2010. Bookmark the permalink. I am interested in trumpet classes for my daughter? she has mentioned Paul Marsden as I believe he teaches another young girl in the Liverpool philharmonic choir? My daughter also sings with the choir. Can you help?